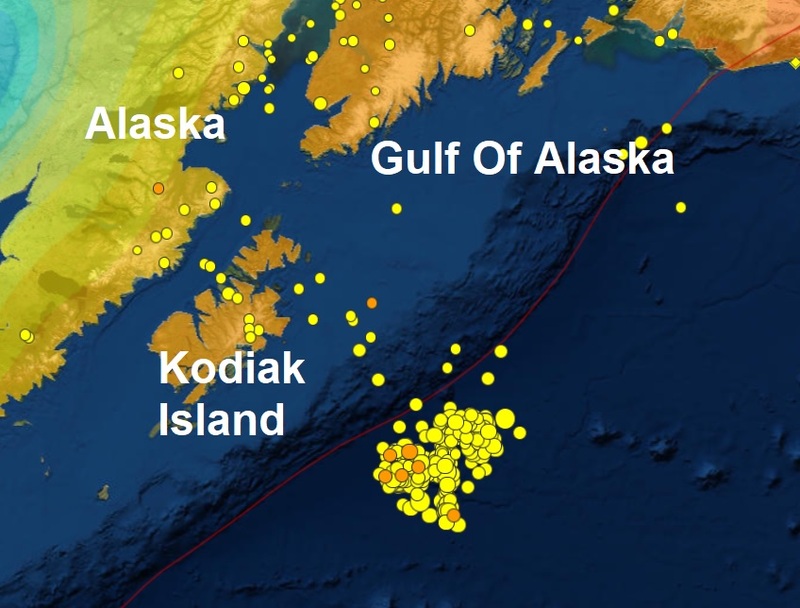 More than 400 after-shocks have rattled the Gulf Of Alaska after the powerful mag 7.9 rocked Kodiak Island on Tuesday with many of them significant and some in the mid 5 magnitude. The huge earthquake of magnitude 8.2, reduced by USGS to a mag 7.9 struck 256 km (157 miles) southeast of Chiniak, Alaska at a depth of 10 km n Tuesday morning, see below. With American west coast residents well aware a "big one" is guaranteed probably sooner rather than later Tuesdays massive quake came as quite a shock, especially as a tsunami warning, was issued for the entire west coast which turned out to be a glitch from data sent by an Alaskan buoy at station 46410. On Friday morning the US West Coast rode their luck once again when a mag 5.8 - 173km struck W of Ferndale, California with a mag 5.0 after-shock, which could have been much worse. "The Big One" is well overdue, according to Wikipedia, a study published in 2006 in the journal "Nature" found that the San Andreas fault has reached a sufficient stress level for an earthquake of magnitude greater than 7.0. This study also found that the risk of a large earthquake may be increasing more rapidly than scientists had previously believed. 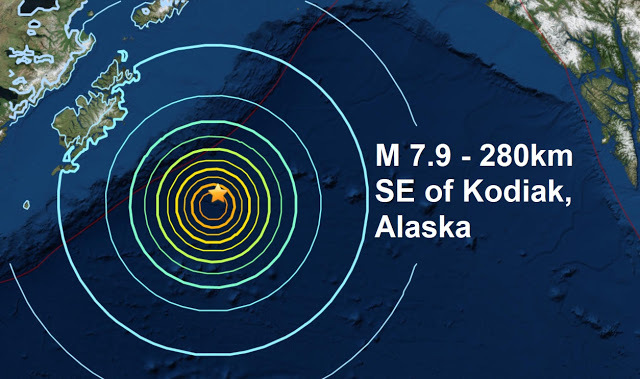 Whats more important the M 7.9 - 280km SE of Kodiak, Alaska on Tuesday didn't cause any injuries or cause any damage! Incredible considering the shallow depth of the powerful Alaskan quake. A tsunami could have been a disaster for millions of people from Alaska to Southern California but it didn't materialise, luckily. With nearly 300,000 people evacuated or affected by Pacific Ring volcano activity this last few weeks and the fact that millions got lucky along US and Canada coast once again, we should be counting our blessings. 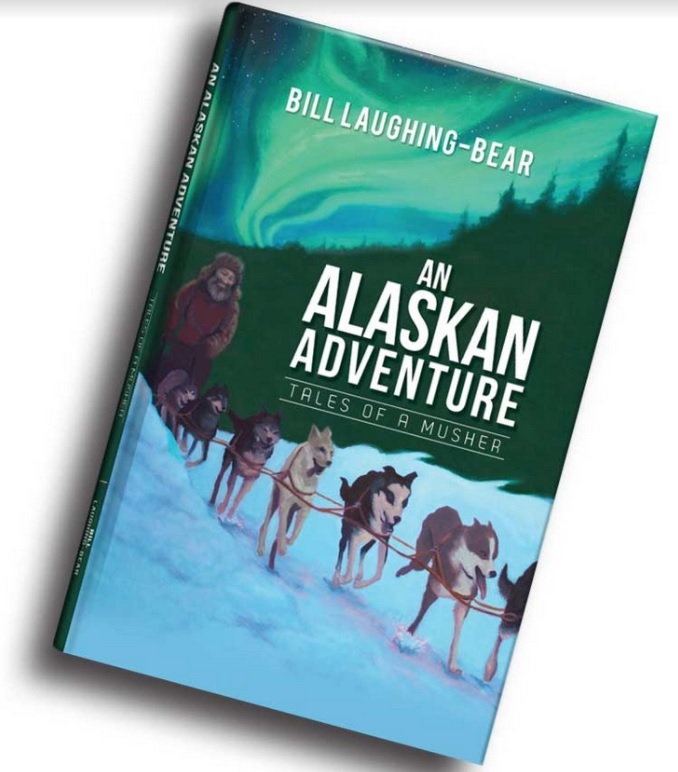 I live in Big Lake Alaska my home is steel frame 3 story this quakes rocked and shook for many minutes one of the top longest ones I have felt. Are you still feeling the after-shocks?